monks, the Knights Templar. In the latter half of the 1400s, Pope Paul II granted the monastery to the Sovereign Military Order of Malta. But after that, the property changed hands periodically, even becoming a precursor to Starbucks as a coffee house frequented by artists in the 1600s. The present structure was restored by the famous artist and architect Biovanni Battista Piranesi in the late 1700s. 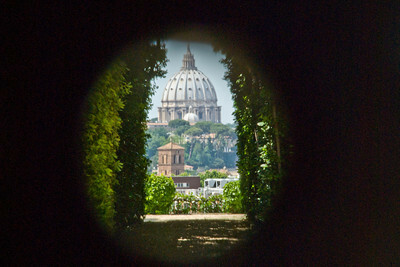 So, when you lean over to look through the keyhole, you will see an exquisite, tiny view of St. Peter’s Basilica perfectly centered in the opening. For some reason, peering through a keyhole sounds very Alice in Wonderland to me. Or maybe like some secret place Bilbo Baggins would take you to see in the Shire. But a real place in Rome? Yes! And I am enchanted by the thought of walking up to that door to look through that keyhole myself. The Romans call it “the hole of Rome,” which not a very romantic way of describing it, I’m afraid. You can find it high on the Aventine Hill in the Piazza dei Cavalieri di Malta, or the Piazza of the Knights of Malta. The door is set into a high wall decorated with ancient obelisks and military insignia. Unless you arrive right behind a tour bus, chances are there won’t be that many visitors in line waiting to walk up, bend forward, and peer through the keyhole to see a perfect little cameo of the Vatican’s iconic dome. No one knows if the door and keyhole were placed purposely, or if the view is a stunning, perhaps even heavenly, bit of serendipity. Regardless, I want to see it. I haven’t yet because Aventine Hill is not anywhere near the well-worn paths to Rome’s more obvious attractions. And since peeking through a keyhole won’t take much time, I wondered if there were other things to see in the vicinity. Sure enough, another little-known attraction nearby is the Mouth of Truth. The What the What, you ask . . . ?! When I go to check out the green door, I also plan to visit nearby Santa Maria in Cosmedin to view the church’s notable 11th century frescoes, as well as its picturesque 12th century bell tower. 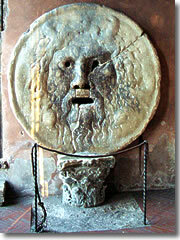 But the big attraction, I have to admit, will be the Bocca della Verita, or Mouth of Truth. The Mouth of Truth is a heavy stone disc carved in the fourth century B.C. with a scary, bearded face baring a gaping, dark gash of a mouth. Medieval legend had it that if you put your hand in its mouth and told a lie, the ancient mouth would clamp closed upon your tender fingers. Ouch. If I come home with mashed fingers, we’ll know the Mouth of Truth is still doing its job. What shall we do in Rome next? We shall see, miei cari, we shall see. Ciao! This entry was posted in Uncategorized and tagged Audrey Hepburn, basilica, Green Door, Gregory Peck, Italy, Knights of Malta, legend, medieval, Mouth of Truth, pope, Rome, St. Peter's, travel. Bookmark the permalink. Hello, Neat post. There’s a problem together with your website in web explorer, could test this? IE nonetheless is the market chief and a big part of other people will leave out your fantastic writing because of this problem. Thanks for writing and I appreciate the support! I tried pulling up the site in Internet Exporer (I usually use Google Chrome) and it seemed okay. Not sure what else to do!